I have one of these and like it a lot, used to carry it every day around my neck, it's designed to fit into an empty Altoids tin: https://www.knifecenter.com/item/CR2...e-kydex-sheath A knife, tinder and spark, duct tape, whistle, signal mirror, pencil, paper, water purification tablets, a heavy-duty Ziploc bag (canteen) will all fit the Altoids tin. Add a space blanket, a tourniquet, a compression bandage, and gauze and it will all fit in a small pouch that will fit in cargo pants or a jacket pocket. Two bits of trivia: The movie audio track has Major Kong saying, "...a fella' could have a pretty good weekend in Vegas with all that stuff," but in reality, Slim Pickens' lips say, "Dallas". They dubbed in "Vegas" after Kennedy was shot in Dallas. ...and apparently ol' Slim didn't know it was a comedy. Pickens was not told that the movie was a comedy and was only shown the script for scenes he was in. As a result, Pickens played the role "straight". Add a small personal locator beacon and a small strobe light. survival Kit Option. Buy a fishing vest. They have several pockets front and back. Buy a fisherman's vest. It has many pockets for 1st aid and survival items. They cost about $15. Use a permanent marker to number each of the pockets. In pocket #1 place a table of contents sheet telling what is in all the pockets. I wear mine in the back country flights. There is room in the back for rope and a small pistol. If you carry a personal locator it should be included. With the vest on your body you have easy access to its contents if you are partially disabled from the crash. The rope tieing it down was a bit loose. 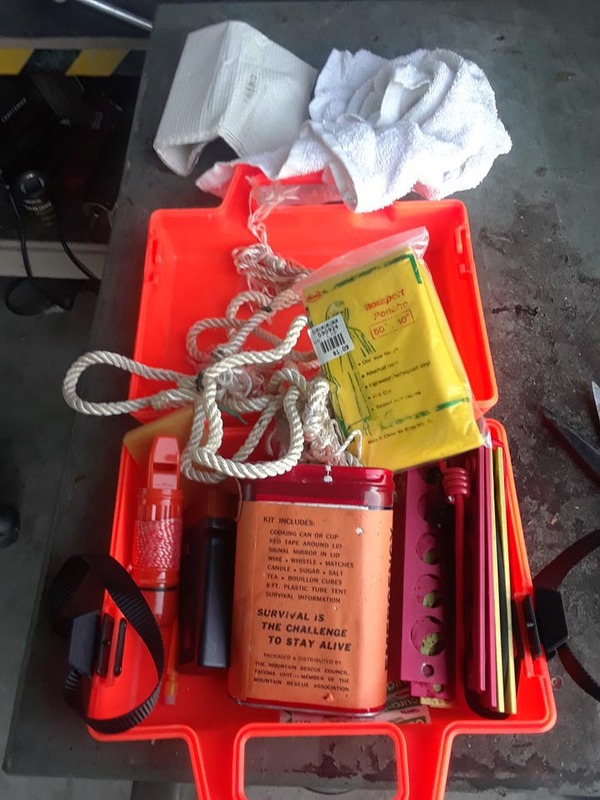 Started to look how to adjust it, then realized in the 22+ years I've owned this airplane, I'd NEVER taken the survival kit out and looked at it. Wire variety of stuff, including some food items which might not still be edible and a flashlight with dead batteries. Had some stuff I didn't think was necessary, such as a set of anodized aluminum chocks. It's a fun game, thinking about how to restock it. But something occurred to me. Like some of us, I've got a single-seat airplane. The kit was located in a box behind the pilot's seat. If I had a bad crash and couldn't move, I wouldn't be able to get to it. Or, if I were bleeding badly, would I have enough time to crawl out, remove the seat, then reach back deep into the baggage compartment to get the kit? So now I'm thinking of adding an "auxiliary" survival kit, within reach of the pilot. There are a couple of nooks and crannies that I think I could rig up to hold some small items. So...what should be included? Remember, we're not talking about survival kits in general, we're talking about what's within reach of the pilot seat. IMHO, the best idea so far. I was taught that "If it aint on you, you won't have it!" A mesh vest is more comfortable in hot climates. Get an oversized one that can be worn over outer garments in cold weather. I used to wear the same survival vest that Uncle Sam issued to me when flying Moonys, Skyhawks and Cherokees up and down the east coast. A real good item would be a signal mirror. When I was a Med Evac pilot, I was once sent out to pick up a Ranger patrol. I spotted their signal mirror well over seven miles out. I also found an item amongst my "stuff" that was issued to me when I was flying in SE Asia. Its a half yard wide by ten foot long piece of bright red guaze-y cloth. Not quite cheese cloth. Its folded and rolled up to the size of a big cigar. I carried it in the leg pocket of my flight suit. Its in my desk right now next to a couple of space blankets. It is so cheap that when I left my unit, They said to keep it. Not so the blood chit. That scrap of cloth is in effect a promissory note from the US Govt. With no limit. Strobes are a must have. Waterproof matches or disposable lighter are must haves. Another Item that I would include would be a magnifying glass. It comes in handy in case you need to start a fire and all of your gear is wet.Cloudy days could be a challenge but it doesn't weigh that much so I would include one!